Most cell phone users haven't used or tried to use custom ringtones and it can be confusing. Smartphones are the easiest since you can often download the ringtone file directly to your phone. You can usually send a ringtone to a standard cell phone by e-mail from a computer, using a special e-mail address which includes your cell phone number. This link gives good directions for doing that in 12 steps and includes e-mail addresses for most cell phone brands. Smartphones are divided into three basic types, iPhones, BlackBerries and all the others, commonly referred to as Droids, thus there are different links on the Old Volvo webpage. The Droid ringtone should work on a BlackBerry as it's a simple mp3 about 24 seconds long. There is also a .ogg file. Right click any of the three links and choose <Download Linked File> and they will go to your default download location. They will play on any computer and most cell phones, including iPhones. If the iPhone version adds a .txt to the file just delete those four characters. To be used as a ringtone, any music file has to be in your phone's ringtone folder. Getting it there is the tricky part. When downloading directly to your phone, the file may not download directly to the ringtone folder. If you can't move the file using just your phone, you'll have to connect your phone to a computer and drag the ringtone out of the phone's download folder or music library folder, and into the phone's ringtone folder. This will almost always be the case with iPhones which will only access the ringtones folder in iTunes. 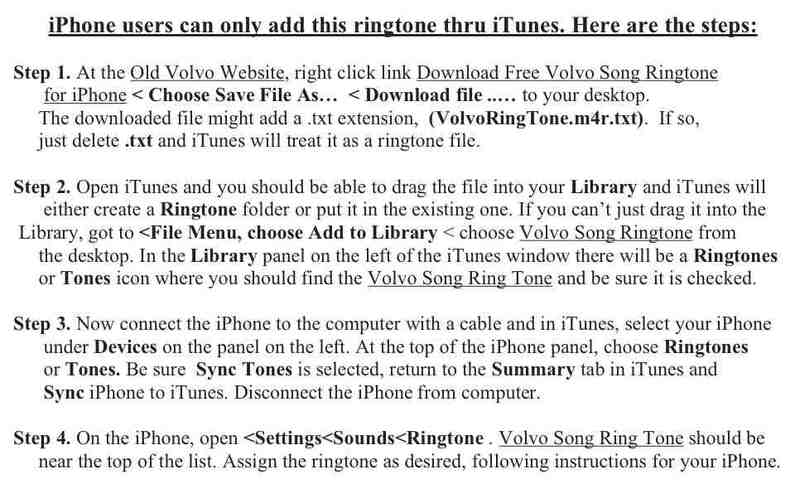 In the table below are specific dircections for getting the ringtone into iTunes and then into your phone.